According to a recent study, it has been found that most of the mobile app developers all around the world are facing the deficiency of Vitamin “A”. You might have been expecting similar lines in this topic and why one wouldn’t as such titles generally begins with such lines only. However, I am not here to discuss the developer’s health, but it doesn’t mean I don’t care about it; being a developer myself, I wish a great health, body, and mind for developers all around the world. Not only for developers but for every living being. 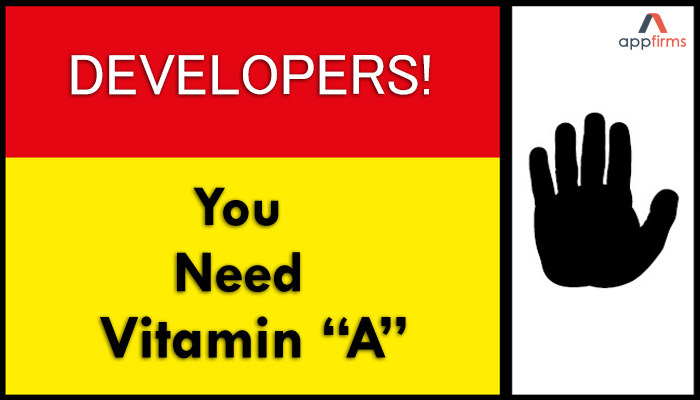 Well, coming to back to my title, some of you might be confused and wondering as if it is not about the health then how developers lacking Vitamin “A”. Well, to clear the smoke of confusion here by Vitamin “A”, I am referring to Vitamin “A” where A stands for “AppFirms”. Why Am I Praising AppFirms? Well, I may not be the first but surely the satisfied and a “Busy” mobile app developer registered in the AppFirms. Sorry, I forgot to mention the world “Proud” in the above line. But surely, sooner or later the AppFirms is going to cast its shadow over the world! Be Your Own Boss Developers!